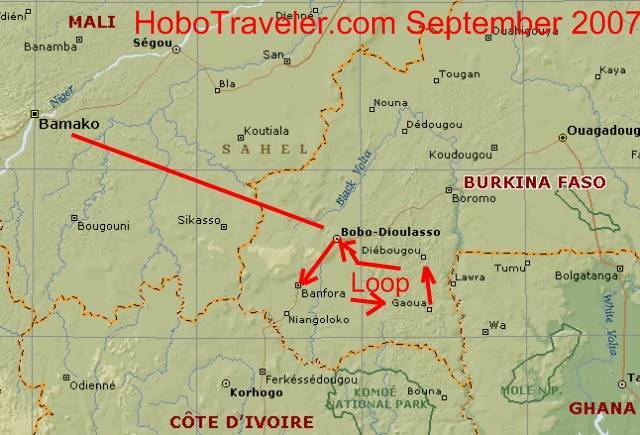 I leave in 3 hours for Banfora, Burkina Faso; I do a loop, the return and take a difficult for Africa traveler, easy for South American traveler trip to Bamaka, Mali. I hope to make this loop below with the least amount of Transportation headaches. I am not sure, I am hoping there is a 1-10 day city in this loop, I need a pause in the action. Bobo is 100,000 people too big, and Banfora is supposed to have around 50,000 people, and Gooua under 20,000 and Diebougou under 20,000 according to the Encarta Encyclopedia little dynamic sensor hand waving over the map. I discovered this wonderful feature two week ago, tells population, longitude and latitudes quickly. Yep, this is me, I just checked, I am an under 100,000 or close to around 50,000 people city person in Africa. I checked two cities I really liked, Natitingou, Benin and Kpalime, Togo and both log in at 20,000 to 99,000 populations. Bobo is too big for comfort, not easily manageable, too big to take a taxi across in one swoop, or too big to walk across easily. I try to stereotype myself, and then travel to visit my stereotype, I accept, I am a stereotype as is everyone, on Tuesdays or any other day of choice.